The 33rd annual Festival of Sharing was held at the Missouri State Fairgrounds, in Sedalia, on Saturday, October 18, 2014. 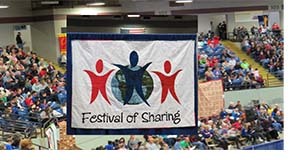 The 2013 Festival of Sharing was held at the Missouri State Fairgrounds in Sedalia Missouri. For 36 years the Festival of Sharing has been about the ministry of alleviating hunger through gifts of mercy, advocacy and education. After working all morning the problem of hunger was brought home to the youth as they were divided into groups to receive typical food given in food lines. Group one lined up in front of the Asia food line and received a lunch of white rice. The Africa group received cold beans. Latin Americans received brown rice and Americans received mac & cheese, however, not the kind made with fresh milk and butter. The discussion afterward helped the youth to understand that their work during the Festival of Sharing was directed to helping such people represented in the food lines around the world. 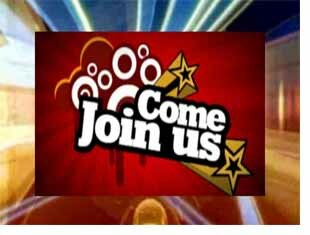 Download or View MissionCast (Downloads will be available on Tuesday, July 30, by noon. For the third year the women of the Stover United Methodist Church and Christ Lutheran Church have sponsored a Festival of Sharing Quilt Show. The admission of $5 provided a delicious lunch prepared by the women of the two churches and a view of some of Missouriâ€™s best quilts. The proceeds went to the Festival of Sharing. 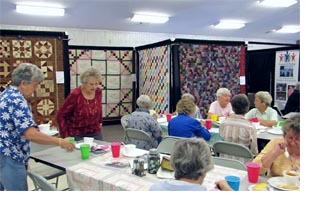 Over 200 quilts are auctioned each year at the Festival of Sharing. 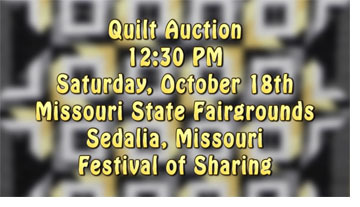 All of quilts in the Stover Quilt Show and more will be on display at the Festival of Sharing before the auction gets under way, at noon, on Saturday, October 19, in Sedalia, at the Missouri State Fairgrounds. All of the quilts are made and donated by individuals and congregations of many different denominations. All of the money raised is used by Church World Service for blankets and development projects for people in crisis from disasters and poverty.